MacDonald, who is now a matchday corporate hospitality host at Rangers, made them wait to learn their fate in the first round draw of the Scottish League Cup when he pulled them out of the pot last at Hampden yesterday. A home tie against Peterhead completes Warburton’s early competitive schedule in charge of Rangers with the match on 1 August sandwiched between their Petrofac Training Cup first-round trip to Hibs on 25 July and their opening Championship fixture against St Mirren at Ibrox on 8 August. 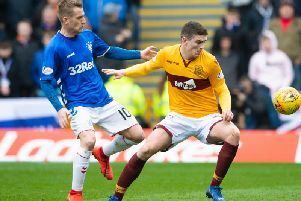 It leaves Warburton’s first-team squad still short of numbers after the release of all 11 players whose contracts expired at the end of last season’s failed attempt to secure promotion to the top flight. MacDonald is optimistic former Brentford boss Warburton will further utilise his contacts south of the border to add further reinforcements and believes wide players and strikers should be the priority. “I’m happy there now seems to be more stability at Rangers, there’s no doubt about that,” said MacDonald. “Last season, I don’t think the majority of the players were on the same wavelength. They were playing as individuals and were different types of players. Some had energy, some didn’t have energy – and you are looking for everyone to be on the same wavelength as far as football and fitness are concerned. “We want good quality brought in by the new manager. Where he has come from, there is a big pool of players down there that he will know all about. “When I was a manager, I went down there a few times to get good players from even the third and fourth tier of English football. For example, I signed Mike Galloway from Halifax Town when I was Hearts manager and he went on to play for Celtic and Scotland. “So the players are there at that level. You just need certain people to give you an idea and obviously with Mark Warburton’s background, he is the right man to do that. “It was very frustrating watching the team last season. You can make anybody a scapegoat for it, but it was just one of those things for players like Kris Boyd and the others who it didn’t work out for. “I felt sorry for him because he needs to be supplied and it just wasn’t there for him. The team were not playing to his strengths, not providing ammunition from wide areas. Hearts and Hibs also landed home ties in yesterday’s draw. The Tynecastle side will entertain Arbroath on a midweek date either side of their Premiership opener against St Johnstone which takes place on the same weekend as was scheduled for the League Cup first round. Hibs will welcome Montrose, the lowest-ranked team in the tournament, to Easter Road. SPFL chief executive Neil Doncaster, who conducted the draw along with MacDonald and former Celtic and Aberdeen winger Joe Miller, admits league reconstruction would be desirable in order to ease the current schedules facing Scottish clubs. But he believes finding agreement on an alternative to the current set-up remains unlikely. “Within the current format we have, there is very limited flexibility,” said Doncaster. “If you were to look at a different format that would create fewer games than the 38 we have in the top tier at the moment, it would create a much more flexible set-up to enable us to perhaps have a winter break or schedule games away from the worst of the winter weather.